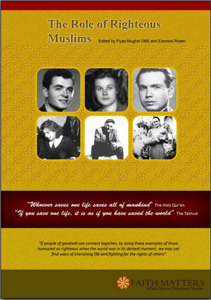 This booklet, (the Role of Righteous Muslims), is aimed at broadening knowledge and awareness of the roles that some Muslims took during the Holocaust and whose stories show the moral and physical courage of these individuals who believed in doing what was right. Today, unfortunately, xenophobia and fear ‘of the other’ still continue to plague societies and the United Kingdom is not immune to these issues. The caricaturing of communities continues in some quarters and the lessons of history are not learnt. Yet, history should teach us and guide us so that we preserve the stories of our common humanity and social links which should not be forgotten. Furthermore, these stories should not be physically or mentally shelved as though they have no significance in the modern world. If anything, they have a greater significance today then they would have had 10, 20 or 30 years ago. The Righteous Muslims booklet shows us that there are many stories of positive Muslim and Jewish interaction, even at the darkest moments in history. It shows a common bond and a link between people of two faiths who believe in the compassion of God and in the sanctity of life. Whilst the politics of the Middle East may block such stories out of the public narrative, there is a duty on us all to ensure that they get their rightful place in our social and educational narratives.